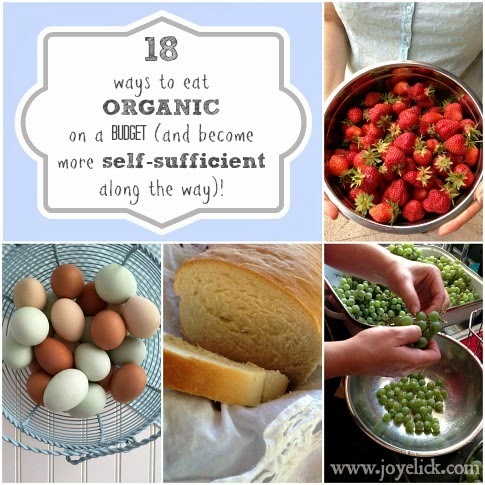 18 ways to eat ORGANIC on a BUDGET (and become more self-sufficient along the way)! 18 Budget-savvy tips to help you eat organic. 1. Begin a made-from-scratch life. This is by far the best way to save money on groceries. 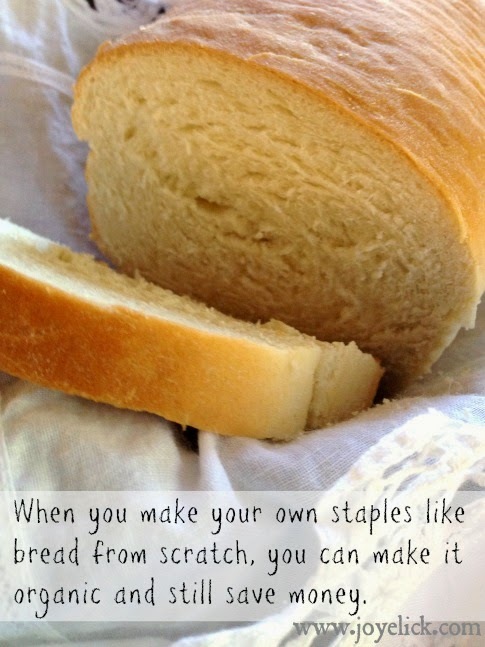 Whether you make your own bread, pancake syrup, ice cream, yogurt, or homemade laundry soap--a made-from-scratch life has multiple rewards. Nothing beats the satisfaction of knowing how to make the things you need from just a few basic supplies you keep stocked in your pantry. When it comes to saving money, it's a whole lot cheaper to stock a few dry goods in your pantry, and a few basic items in your fridge than it is to buy individual pre-made products from the store. For example, one 10 pound bag of organic flour from Costco costs about the same (or less, depending on time of year) as only two loaves of organic bread. Just think how many loaves you could make with a whole bag of flour. And who knows, maybe you and your family will decide that making your family's bread is a fun way to spend time together (and it is!). 2. Switch gradually from conventional to organic. Don't expect to change everything all at once. If you try to suddenly switch to organic for all your food buying, you'll notice a more dramatic jump in cost. Instead, make a gradual change. Decide which items feel most important to you and your family to become organic. Do you want to start with changing to organic produce, because you want to avoid pesticide residue? Then focus on buying organic strawberries, spinach and other things before converting to all organic grains or meats. Likewise, try changing one area of your grocery budget per month, or per quarter. Sometimes, the price between conventional and organic may seem startling, but once you see, taste, and feel the difference in the quality of your food, you'll be better able to judge if paying a bit more is worth it and where to go from there. As you begin to eat organic, evaluate the difference in quality and flavor, as well as your peace of mind. The more felt benefits you experience, the more likely you'll want to make further changes, but now you'll be doing it based on how you believe it benefits you and your family, and the cost becomes justified. Finally, keep in mind, you can often find good sales on organics just as often as conventional foods. By becoming a smart shopper, and by following some of the other suggestions in this post, who knows, you may not feel much of a bump in your budget at all. 3. Grow your own. Whether you start large or small, growing your own fruits and vegetables is one of the best ways to have organic produce at your finger tips. It doesn't matter if you live in the city or the country, anyone can garden, even an apartment dweller. If you don't have a large patch of ground, you might try container gardening, or do a Pinterest search and discover the many ways of doing a vertical garden. As city dwellers for many years, my husband I were able to make good use of a small yard. We grew enough strawberries each year to put away many bags in the freezer, as well as multiple batches of freezer jam year after year--all from an 8'X8' berry patch. Then we did the same thing with three patches of raspberries, followed by three blueberry bushes. We even planted two peach trees. Add to that my container herb garden...you can see how it's possible to turn an urban yard into a productive organic garden. Now we have a small hobby farm where we can really start to expand, but I shared this to illustrate that even with only a small space, you can supplement your pantry with homegrown organic food and dramatically reduce your food bill. Then with the money saved through your gardening efforts, you can invest in other organic food. 4. Buy local and in season. When you buy produce in season, it's going to be lower priced than when it's out of season, because of supply and demand. Likewise, if you buy local, your food didn't have to travel as far which should keep the cost lower (and your food fresher) than the same food that was transported across the country, or from the other side of the world. 5. Buy the least expensive produce available. Why buy strawberries at $4.99 a pound when bananas are only .75 cents a pound, and apples are only $1.59 a pound? Fruit is fruit. If you really want the strawberries, wait until they're in season, when they're the cheapest. But don't forget the freezer aisle. Often, frozen food costs less per pound than fresh. Plus, food that is frozen is picked and packed at its freshest point, so you don't need to worry about its nutritional value being lost. Depending on what you like to use strawberries for, frozen may work just as well as fresh, such as in smoothies. 6. Start with a whole organic food and process down yourself. Why pay the cost of a processing plant to slice or grate your cheese for you? Pre-sliced cheese requires so much more packaging, and store-bought grated cheese often contains anti-caking and mold-inhibiting ingredients. Usually, ounce-for-ounce, a brick of cheese costs less than a package of plastic wrapped cheese slices, or a bag of cheese that's been shredded for you. So bring home the less expensive multi-purpose brick. You'll have cheese for slicing or for grating all in one. Another example of this concept is beans, like for chili, tacos, etc. Ounce-for-ounce, canned beans cost nearly 3 times more than dry beans. 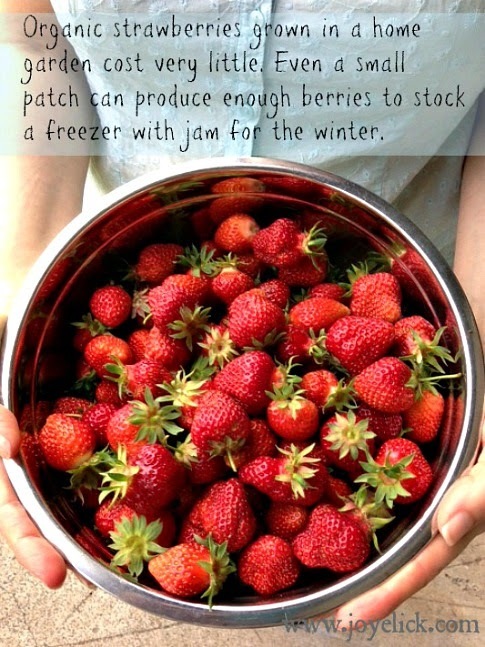 You'll save money by preparing them yourself from scratch, then freezing them in 2 cup servings (equivalent to one 15 oz. can) to use in the place of cans. This concept can be applied to all sorts of foods. When it comes to eating organic, it may be easier to buy the organic version of a whole unprocessed food, then process it yourself into the form you need it. 7. 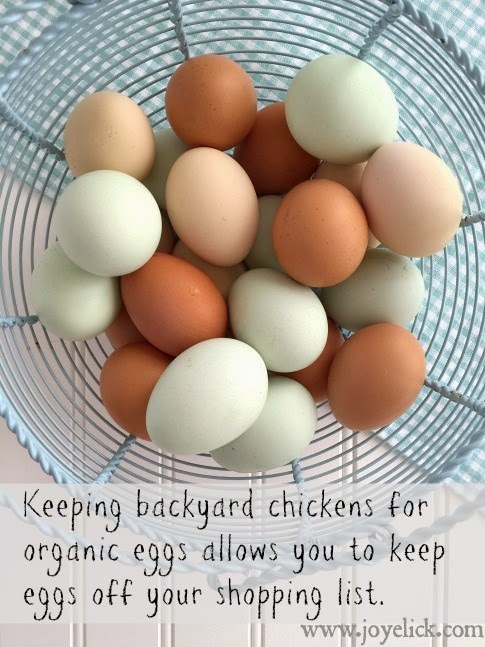 Raise your own poultry for organic eggs and/or meat. A few months ago, we got our first 8 baby chickens. Now, we're finally reaping the reward of raising our girls: fresh eggs every day! (But before you buy your own flock, you should know, raising chickens costs money, however, there are frugal ways to go it, but that's the subject of a future post). Besides eggs, some people like to raise chickens for meat, too. I used to think I wanted to learn to slaughter our poultry. I couldn't understand how people could think of chickens as pets. That was before we got our little fluff balls. Little did I know there's something called imprinting, when the bird and the human form a bond. I thought I was immune. But alas, I was not. My eight chickens soon had names: Nutmeg, Honey, Butterscotch, Peanut, Cracker, Cocoa, Pepper, and Olive (all clever pantry names). I'd take turns giving each of them their fair share of cuddle time. Sigh. Raising our birds for poultry meat is now off the table for us. (Instead, we're enjoying the unexpected delight these pet birds bring us). Yet for many people, raising homegrown meat birds is a very viable way to save money while obtaining the highest quality organic meat. (You just have to be less of a softy than I am to make this work!) 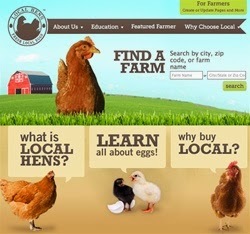 If you're interested in raising your own chickens for eggs and/or meat, be sure to check with your local laws. Many cities now allow urban backyard chickens (and if they don't, it's a growing trend, so they may soon change). Yet, there are probably restrictions on the number of birds you can have, and a rooster probably can't be one of them. 8. Make it stretch. Learn to use food items to make more than one meal. For example, buy (or raise) a whole fryer chicken and stretch it into three or more meals for your family. Eat roast chicken for dinner one night. Then use the leftover meat scraps to make sandwiches or a casserole. Finally, use the carcass to make soup stock, then turn it into a big pot of soup with vegetables and meat scraps that can be itself more than one meal. This is something you can work into your weekly or monthly meal planning (which I will soon dedicate an entire post to). 9. Visit farmers markets and roadside stands late in the day. That organic roadside corn stand is a great way to buy locally grown corn. However, sometimes the prices at a farmer's market or road stand can scare a thrifty shopper away. But if you stop by near the end of the day, Farmer Jane is often willing to cut you a deal. She'd rather send you home with her corn than take it home with her, where she's got plenty more where that came from. Don't be shy, but do be kind when striking your deal and everyone can win. 10. Make your own organic pre-made baking mixes, and herb and spice blends. 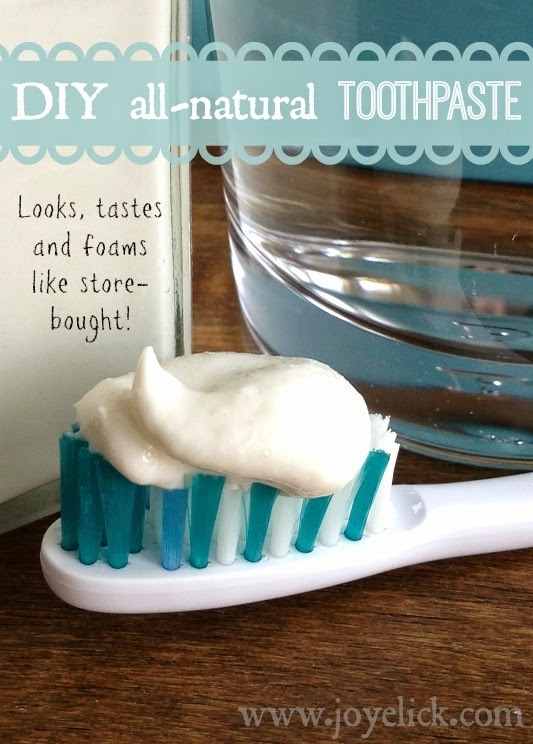 This is a great way to save money and fit organics into your budget. 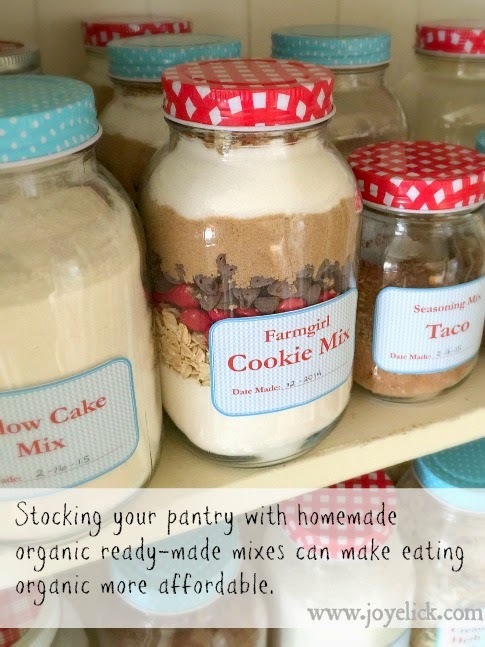 Simply buy organic pantry supplies, then mix your own pancake mix, biscuit mix, muffin mix, etc. This way, you'll spend less for organic mixes than you would on conventional store-bought mixes! (And what you make will taste so much better, because each ready-made mix retains that made-from-scratch quality). When it comes to herb blends and seasoning mixes, simply compare the prices in the spice aisle at your local store with the cost of growing your own herbs, and you'll see the effort is well worth it. And when you grow your own, you'll have year-round access to great seasoning, whether it's fresh, dried, frozen, or salted, depending on how you choose to preserve your bounty. 11. Switch to a cash only grocery budget. There's no better, sure fire way to stay in budget then to shop with cash only. Leave the check book and plastic at home. When you shop with cash, you're limited to only the money you brought with you to the store. This is a tried and true trick employed by the thriftiest shoppers, and a great way to ensure you stay on track, even when buying organics. 12. Learn to forage or glean. This one is fun, because foraging and gleaning can be an adventure for the whole family. Foraging is when you gather food from places in nature where it grows free for the taking. This might be a hedgerow of blackberries, an apple tree in a meadow, wild huckleberries or blueberries, dandelion greens, or chives gathered along a path--the possibilities are endless. Like a treasure hunt, it's fun to look for and gather food from places people have overlooked as a food source. Just make sure that where you gather is not a place treated with pesticides or herbicides, and that you're not trespassing, and the food is fair game. 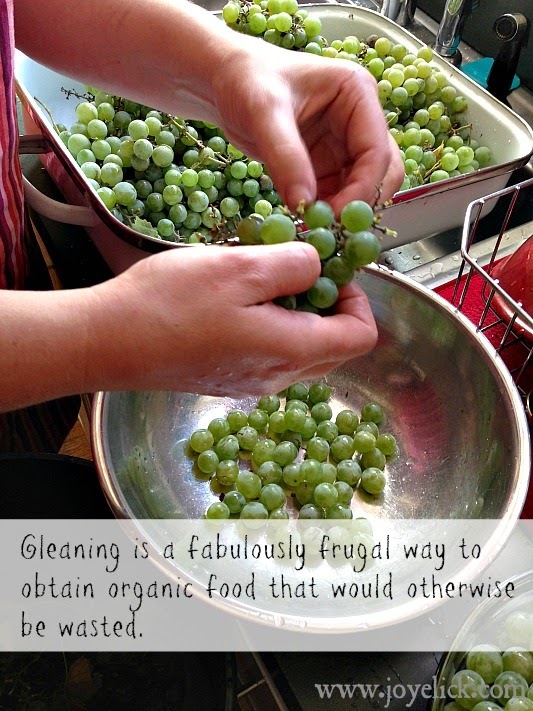 Gleaning is a similar concept to foraging, with the difference being on where you gather. When you glean, it's usually from a farm or neighbor where you've arranged permission to pick the fruit no one plans to use, such as after a berry crop has been officially harvested and you arrange to pick the berries left behind. Or you arrange to pick the apples in a neighbor's yard, who would otherwise let the fruit fall to waste. One year, my husband and I gleaned nearly three bushels of some of the most delicious apples from an apartment complex where the trees were considered ornamental more than food producing. We knew the owner. The trees hadn't been sprayed with anything and it just happened to be a year the apples were naturally undamaged (for the most part) from worms or pests. That year, the two of us had our first canning adventure in which we learned to can jar-after-jar of apples. And all for free! Another year, my sister picked enough grapes from a neighbor's yard to cover two dining tables and make nearly sixty quarts of absolutely delicious grape juice, which we split between us when we were done! 13. Make a list and stick to it. This is huge. Your shopping list is like a map to get you to where you want to be in your budget. Never go to the store without a list of only what you need. In fact, try to avoid going to the store more than once a week. If you're really serious about staying in budget so you can afford more organics, shoot for only shopping twice a month! This isn't as hard as it may sound. The key is in the planning. (Watch for more posts on this topic). 14. Shop the perimeter of the grocery store. Does this sound strange? There's a good reason to stay away from the center of the supermarket. That's where all the processed foods are lurking. Not only are those foods laden with unwanted chemicals and preservatives, all that processing and packaging costs you money. The perimeter of the store, on the other hand, is where the whole foods are stocked. From produce, to fresh meat, to dairy products, you'll find it all around the outer limits of the store. Whole foods are not only better for you and your family, you'll save money when you purchase these and process them yourself for meals. By avoiding packaged and processed foods, you'll have more money available to buy the organics you want. 15. Go meatless part of the time. A pot of homemade beans costs far less than even the cheapest cuts of chicken or beef. Yet, beans are a rich source of vitamins, fiber, minerals, and yes, even protein. Beans make tasty burgers, tacos, soups, salads, enchiladas...you name it. I've heard you can even use beans in your baking! Seeds are also rich in vitamins, minerals and good fat, and they are high in protein. 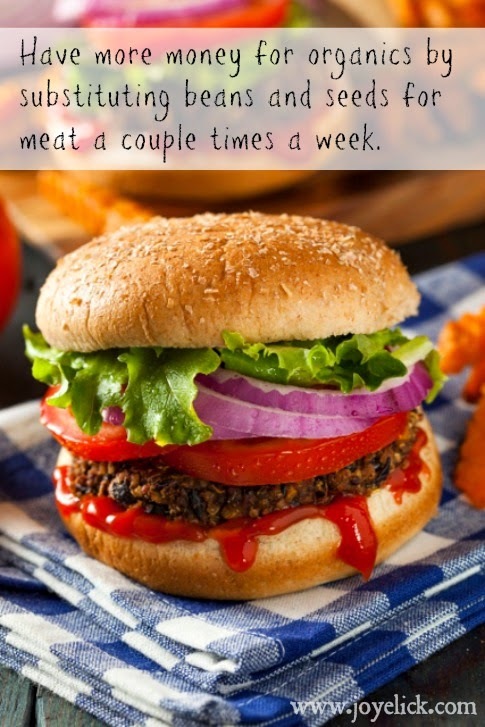 Mixing beans and seeds in things like veggie burgers, is a great way to replace meat (and your family will it). 16. Practice meal planning. The weekly meal plan is a frugal farm girl's best tool for eating organic while staying in budget. When you plan the week's meals based on what you have in your pantry, fridge, freezer, and backyard, you'll discover that you only have a few items left each week that you really need to buy (the short length of your list may really surprise you). Creating a weekly meal plan by shopping your own pantry before the store shelves will leave more money in your wallet for buying organic food. 17. Get creative with leftovers. I love this one. It's a direct branch off of meal planning, but it deserves its own space. Knowing what to do with leftovers is vital to saving money so you can work more organics into your budget. For example, when I plan a meal of tacos that contains re-fried beans and Spanish rice, I also plan to follow that meal up with enchiladas the next night. That's because I use both the leftover beans and rice in my enchilada recipe. So the night I make tacos, I make enough beans and rice to have on hand the next night. I can't say enough about the importance of meal planning, but in this case, it's having a plan for leftovers. But leftovers can happen without a plan. That's when you get creative. For example, this week I made spaghetti, and of course we had leftovers. So the next night, I put the spaghetti and sauce in a casserole dish, topped it with mozzarella cheese and olives and baked it like a lasagna. The family loved it. Of course, you can always simply eat your leftovers just as they are. They're like a convenience food you didn't spend extra on, and they're healthy because they're homemade. 18. Limit shopping trips. Lastly, here's another general budget tip that can help you have more to put toward organic foods: The less you visit a store, the less likely you are to spend money. Before I changed how I shop for food, I can't tell you how many times I'd need one item, so I'd run to the store, only to come out having spent an average of $70 on stuff I thought of while I was there. (This wouldn't happen, by the way, if I'd been following a meal plan for the month). Here's the truth: Unplanned trips to the store end up in unplanned spending. So the trick to saving money (and having more for what's important to you, like buying organics) is planning when and how you'll spend. As I already mentioned, if you're serious about spending as little as possible on food, you'll make yourself a monthly, bi-weekly, or weekly meal plan and you'll visit the store only to buy what you need for those meals--and never in between. You'll be amazed at how much you can save and put back into your budget for things like organics. LET'S CHAT FRIEND. What are your tricks for buying organic while staying in budget? I hope you'll take just a moment to share your tips in the comments below. Hello Joy, a great article (again!). I do just about all you mention above and I also make all my salad dressings and most sauces (BBQ, ketchup etc.) from scratch. They taste great, cost so much less that store bought and I know exactly what they are made of. For the last 4 years I have also raised my own chickens for eggs and meat and I buy a 1/4 steer and 1/2 pig annually from a friend. They are not organic certified, but they are grass fed all year, antibiotic free and they do not use pesticides on their grounds, their grass seed is also GMO free (certified), the animals are well cared for and the butcher is very caring about the animals he processes (as caring as you can be I guess!). This means we get some great cuts of meat for the same price as ground beef. It really makes a difference to the budget. If you do not know anyone local that raises beef, pork, lamb etc, you can get the phone book out and look up your local butcher, they will usually be happy to put you in touch with a local farmer who can sell to you as part of a little group. Just thought I would share. Best wishes and please do keep up with this, it's amazing! Hi Michelle. Thanks for your great ideas on raising your own meat. Very helpful. We too have chickens (for eggs--made the mistake of naming them and caring about them, so we can't eat them). We've talked about raising a steer each year, since we have the land to do it. Your comments encourage me. It is probably something we will do as we work down our list of goals. Thank you for taking the time comment. Farmgirl hugs! To get free robux then use free robux generator for the roblox robux game to play free as the question how to hack roblox is too answered by the use of the robux generator for the free robux generation. Sometimes the price of regular expenses go up and it becomes quite impossible to bear them. Recently I was in a financial crisis which was really hard for me to deal with. It was a kind of devastating experience and I didn’t have many options for help. None was willing to help me. But then I ended up to know and got short term cash loans from a lender. They made it easy simple. I just needed to fill out an easy short form and they help me to find a lender for me. It was a great help to me.